Virtua Racing Deluxe is an updated version of the game that first appeared in the Arcades in 1992. This 32X port boosts the number of available tracks from three to five with the new ones being Highland and Sand Park. It also includes two new vehicles to go along with the Formula One car (all-rounder) so you can now choose to race in a Prototype (fastest but bad cornering) or Stock car (medium speed but great handling). Personally, I found the latter to be the best for newcomers as it has more of an arcade feel meaning you don't need to brake as much around corners. 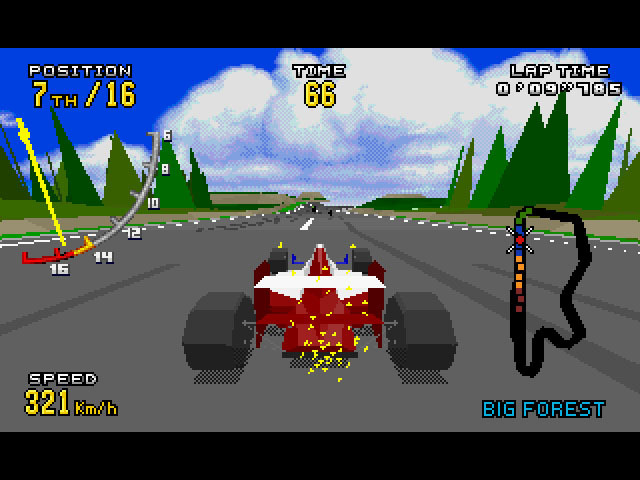 Once you start a race it's clearly apparent that the graphics have had a major overhaul compared to the Mega Drive version (1994). There's far less jagged edges and the draw distance and frame-rate have been significantly improved to make the racing smoother. The three original tracks play brilliantly and each is distinctive with forests, bridges and cliff-sides. The two new tracks fit in well with Highland being a real test of your driving skill with its multitude of sharp corners. Sand Park is the longest track and it's also the least visually appealing as the desert background image is pixelated and jars with the polygon objects around the course. It's still fantastic to play though and it features multiple routes and even a tunnel where the sound effects change to mimic your environment! The action throughout is blazingly fast and thankfully you can still change between four different camera angles to find the one that works best for you. There is a bit of clipping and cars tend to overlap at times but this is really a minor criticism. The music is truly outstanding with some great jingles during the races and amazing upbeat tracks during the instant replays. Virtua Racing Deluxe is everything you could want in an arcade style racer. Sega could easily have done a straight port for the 32X but instead they went out of their way to make this the best version available and the result is a memorable, addictive game that stands as one of the best experiences on the system. Random trivia: Beat all of the tracks in Normal or Hard difficulty and you'll be able to unlock Mirror Mode in the Options menu.